(l to r) Endurance Cyclist Extraordinaire Jim Frink (Rex Cycles), Strong Man Kevin Keenan (Webcor), and Ride Organizer Paul McKenzie (MarcPro-Strava) pose for photo on top of Vollmer Peak at finish with Paul's amazing new Felt F3 bicycle. Just a great day out there all around. Some thanks in order. First to Bill Oldham, who led the large B group through the ride. There were about 20+ riders in this group with varied ability, and Bill's efforts were much appreciated. The fact that he somehow managed to guide 13 of those riders to the summit at Vollmer Peak for a photo opp (see below), is nothing less than flabbergasting, a testament to his guiding ability and patience. Thanks Bill!! Send along some comments if you like. The Nifty light group was small with just 3 riders, as was the A group with just 3 riders. Looking at Strava data, looks like there were at least 4 "A" level riders who did the ride just in front of our group but elected to not be part of the ride, or perhaps started with the B group and just rode off the front. Many riders were able to use the GPS data from the site to follow the course. The feedback I got on this was very positive. Please pass along your experience with following the course with your Garmin to me. I envision by next year we'll see a lot more Garmins out there, enabling riders to set their own pace on the ride, and leading to less waiting and re-grouping. Our A group riding time was 4:30, pretty typical and considering the lack of conditioning due to challenging spring weather, we've got to be happy with it. Kevin Keenan was the strong man of the day, taking all the climbs, including the KOM on Marin in just a few ticks over 8 minutes. B Group Finishers on the summit of Vollmer Peak. So after the 2009 debacle when the B ride finished before the A ride, the rules were changed … only a ½ hour lead time instead of 1 hour. But the big change this year was the popularity of the ride. Instead of the usual half-dozen or so riders, we had approximately 20 starters in the B group. I say approximately because the numbers fluctuated during the ride … with some leaving early, a few starting late, and the usual stringing out of the riders on the climbs, we had 13 riders with the leader in the first couple of climbs, but by the 4 climb had 19, and at one point 20. 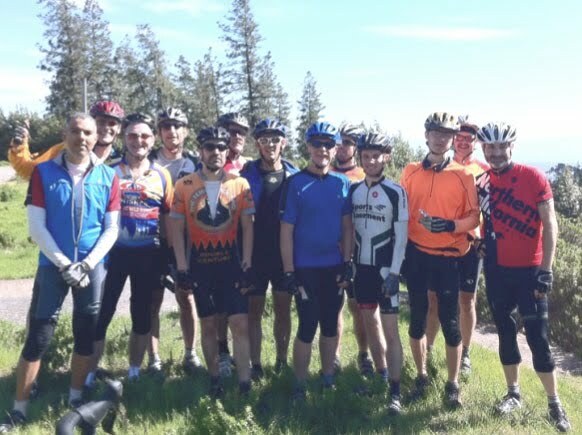 Great participation by Davis bike club with 4 or 5, a Pleasanton group with similar numbers and a rider all the way from Costa Rica, just to join this elite event! There were only 2 of us, I believe who had done the ride before (or would admit it), and all but one attempted Marin. Even Fast-Frank Metzger, with his 39/25 real man gearing, made it up Marin, congratulations! Only a couple of folks had to walk the last block. With such a large group we were slow in clock time and sure enough the A group caught us by the top of Marin (3 climb). I believe we had 13 coming up El Toynal, reconnecting with another 6 at the top (who by going ahead did not benefit from our steeper, more direct route via Loma Vista and Alta Vista), safely negotiated Grizzly Peak, dodging the bicycle-swallowing holes, and wound our way down through Berkeley. I admit skipping the traffic on Euclid in favor of La Loma, so we cheated by at least 50 feet, perhaps 100. First bad tire on Centennial (later another on Canon and a pinch flat on Grizzly). The food and drinks out of Paul’s car were very much appreciated (and decimated). us both on the Claremont warm-up and on the steeps of Volmer Peak (ouch). I attach a photo of the group (less the photographer) at the top. weather imaginable. (And for some great pizza after the ride). Thank you very much for another fun (and painful) Nifty Ten Fifty! You certainly put on a great ride: the route, the support, the views, the (gulp) climbs, the descents(!) and most of all – your pre-arranged “weather parfait.” Believe it or not, I did have some fun trying to keep up with you and “Kevin The Strong” on the climbs. I will commit to more steep hill training for the 2012 edition, but I’ll never be strong enough to keep up with you two. I have to admit though, the best parts of the day were spent following Paul – “Mr. Descender Extraordinaire” – down those wonderful, technical, narrow, potholed, turkey-laden descents. What a rush. Thanks again to you and Janet for putting on a great ride! Thanks for organizing such an incredible and memorable ride. You couldn't have picked a nicer day. the best hills Berkeley has to offer. The Garmin course that you provided was helpful for sure. The only thing that i would point out is that Garmin sometimes gets confused when paths criss-cross. Nevertheless, it was quite useful. lost. So i never really fully utilized the Garmin, but it was great to have it as an option. The rest stop was great and kudos for providing us with some of the Clif products. such a fun ride. Any such plans for the future ? The views of Mt Diablo, Farallones islands, San Francisco, Oakland were truly breathtaking. I plan on being a regular to the niftytenfifty from now on. yes Marin was utterly brutal. I loved Bill's description of Hiller. "Hiller is a real pisser" :) he was absolutely correct. P.S. Would you be able to forward me the full resolution picture of the group at the Vollmer Peak ?